More colleges are reseating their fans annually or every few years to ensure that the best donors are sitting in the best seats. It can be time-consuming and labor intensive for schools that don't have the personnel to quickly move through the seating adjustments. Paciolan, the ticketing software firm that services 105 college clients, is working with a 3-D imaging company, Ballena Technologies, to make the process faster and more efficient. 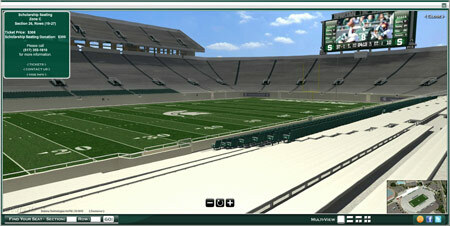 3D imaging, like this for Michigan State's stadium, helps fans quickly ''try out'' other seats. While Paciolan and Ballena have been working together for close to four years, they've seen schools adopt the 3-D seating technology more in the last year as the trend of reseating and seat adjustments has picked up in the college space. Ballena's 3-D seating gives potential buyers a view of the stadium from a particular seat, as well as an overhead view that shows where the seat is in relation to the stadium or arena. Schools can reseat their fans for any number of reasons. They might want to give donors who have increased their giving the opportunity to improve their seats. Schools also reseat when a facility like the football stadium or basketball arena has undergone a renovation and changed the seating configuration. It was an effective tool for TCU when the school rebuilt Amon G. Carter Stadium for $164 million. For some schools such as Tennessee, which has not done a full reseating in football or basketball, Ballena's 3-D technology allows the school to market its unused ticket inventory to potential buyers. Paciolan said 11 of its college clients signed up for the service in the last year. In all, a full third of Paciolan's 105 college clients are now using Ballena's 3-D seating technology. Some schools also are using the 3-D imaging to show ticket buyers where their parking will be. The schools already using Paciolan pay an additional programming fee that's typically a couple thousand dollars to incorporate the Ballena 3-D imaging. During Michigan State's most recent reseating in football, 87 percent of season-ticket holders were eligible to upgrade their seat and half of them logged into the 3-D seating program. The numbers were even higher in basketball, where 91 percent of the season-ticket holders were eligible to change seats and 53 percent used the system. The Virtual Seating Map of the Downtown Arena is HERE! Happy Royals Season to You!